Self-directed IRAs can provide you with significant tax advantages as well as allow you access to a wide range of alternative investments. Once you establish a self-directed IRA, you can begin making contributions for the previous tax year- up until the federal tax deadline of the current year. 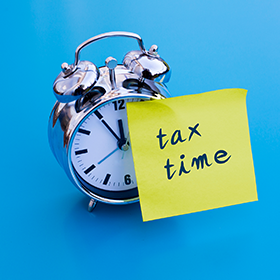 You still have time to make decisions that can improve your tax situation. This year's tax deadline date is near (April 17th, 2018). Be sure to contribute the maximum amount allowed to your retirement and other tax-advantaged plans. How much you can contribute depends on your age, filing status, and income. Find out how much you can contribute. Take RMD if you turned 70½ in 2017. Not taking the RMD means you are subject to a 50% tax on the undistributed amount. Learn more about RMDs. Consider converting a Traditional IRA to a Roth IRA. You will pay taxes upfront on the conversion, but your distributions will be tax-free in the future. Spend the money in your flexible spending accounts before it goes away. Many employers have a grace period to spend previous year's contributions to a flexible spending account. Refill prescriptions, get your teeth cleaned, or buy that second pair of glasses. Make sure you have received all of the tax documents—W2s, 1099s, K-1s—that you will need to file your tax return. You don’t want to be scrounging around at the last minute. Consult with your tax advisor or financial planner to put a retirement savings and investment plan in place that will serve you well into the future. Tax season may never be your favorite time of year, but if you follow these tips, it can be less difficult—this year and next year. Remember, you still have time to open a self-directed IRA if you have not already, or if you have a self-directed IRA, be sure to contribute before the tax deadline, but you must act soon! Contact us today. Previous You Asked, We Answered: Transfers vs. Rollovers - Which One is Right for You?